Late last year, my wife presented me with a novel she had read about, one she thought I would like, a YA title by an author named Jessie Andrews called Me and Earl and the Dying Girl. She said, "It's about a guy who loves movies." I read the back. She was right. Not only does this character love movies, he loves, like, real arthouse stuff, his (as the back cover puts it) favorite influence is Werner Herzog. I read the book. Loved it for the most part. Laughed out loud reading it. As I was in the middle of reading it, I caught wind that a movie adaptation had been made and was seriously racking up at Sundance. Oh, and it did, it won both the Audience Award and the Grand Jury Prize, dedicated to "a film that comprises the best of both great comedy and drama." To quote one of the film's characters, the history teacher Mr. McCarthy (Jon Bernthal), "True fact!" Since The Fault in Our Stars dropped last summer, taking the world's teeny-boppers by storm with its unending sap, there seems to be more of these non-sci-fi YA adaptations popping up lately. Green's Paper Towns has been made and is dropping soon. And I'm sure there are more to come. The teen male-centered human dramedy is on the rise, in both text and on screen, I hope. Anyway, reading Andrews' novel is like reading John Green on speed and with better taste. That is what appeals to me (and other film buffs out there, I'm sure) the most. Me and Earl and the Dying Girl is about a really cool high school senior named Greg Gaines (Thomas Mann), a kid with a sharp wit who loves films. Real films. Criterion Collection and what not. He is also arrogant and features qualities that I find unlikeable. His greatest goal is to not fit in with any one group, to not have true friends. The book and the movie do nothing to help us understand that. Well, his parents are sure weird. His hippy, exotic food eating, sociology professor Dad (Nick Offerman, in a masterstroke of casting) is the one who turned young five-year-old Greg on to Herzog's Aguirre, the Wrath of God. What small child wouldn't love it? His Mom (Connie Britton) is sweet, dramatic, nagging, loving, a bit manic. Both of his parents obviously encourage him to be unique, but, here, they are little more than top quality comedic cameos. Maybe that's just as well. Mom gets news that Rachel Kushner (Olivia Cooke), same age and grade as Greg (they "are acquainted"), has been diagnosed with Leukemia, and, in a scene of pure amazing cinematic referential joy, forces her son to call her, to offer to hang out with her, to befriend a Dying Girl. Then, there's also Earl (RJ Cyler), of course. This is Greg's best friend, though Greg refers to him as an associate, a business partner. Their business is the greatest business. The movie-making business. The Werner Herzog worked on them, so they decided to make films. For years, up to this point, they have been steadily remaking the Criterion Collection and other cinematic classics with punny titles like, "Ate 1/2 (of my Lunch)" and "The 400 Bros" and "A Sockwork Orange." The most entertaining, funny, clever stuff of this film is its love of these references. The film's director, newcomer Alfonso Gomez-Rejon throws every trick he's got in the bag here. This movie is wall-to-wall with movie references, both in-your-face and subtle. It's where a good portion of the comedy comes from. And it is really funny. This is the best comedy of the year, so far. Gomez-Rejon actually shot these childish movie remakes, which are fantastically hilarious. He also shoots scenes to look like other movies or familiar cinematic moments. He uses stop-motion animation as a motif to indicate the film's "Hot Girl" approaches, the lovely Madison (Katherine C. Hughes), a girl with an obvious crush on Greg that he fails to notice in his selfishness and lack of confidence (Oh, the truth in that!!! That is so me at his age!). And, at the center, there is the relationship between Greg and Rachel, the girl who is dying of cancer. He begins to visit her regularly as her treatments progress and she deals and they deal together with something of such a heavy weight it's hard to imagine. Their first encounter is one of the funniest exchanges I've seen in years. The "pillow" humor is on point as is a brief conversation with Hugh Jackman as Wolverine. That range the Sundance Jury was talking about is found here. 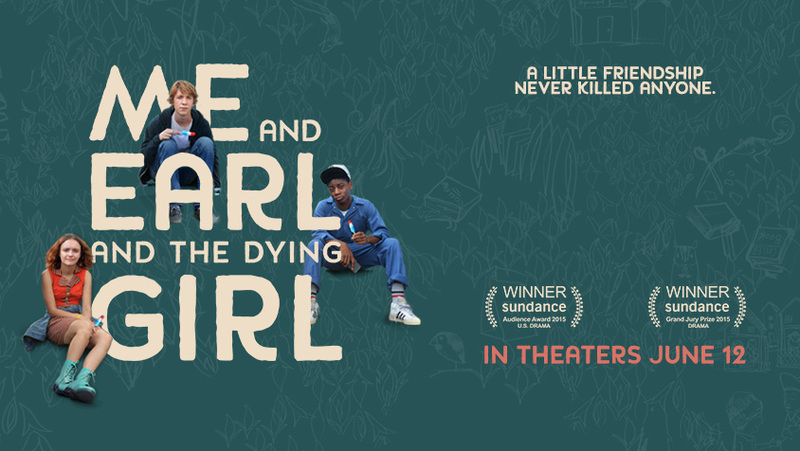 Me and Earl and the Dying Girl is a movie delivered at breakneck speed in hundreds of styles in no particular order that is awe-inspiring to watch. It is a filmmaker's dream, and a film buff's pleasure. In its final act, it manages to lose a lot of this gloriously hilarious pace, which is necessary, but almost a bad thing. A few scenes drag out and don't exactly land, and then everything gets packaged up a bit too nicely and the humor just vanishes. It didn't have to. I had trouble with the end of the novel just as I did this movie version. That can't be helped. It's a narrative thing. Not a movie quality thing. This is an expertly made movie. It is one-of-a-kind. Note: And it's movie I hope teenagers see. It is lucky to have a PG-13 rating, despite some language and sexual talk. It is unlucky in that it is only playing in smaller theaters, at least where I live. Teenagers don't go the the CinemaArt theater, at least I've hardly seen any there. WHY WON'T MOVIE STUDIOS AND DISTRIBUTORS MARKET THESE MOVIES FOR TEENAGERS!!!!!?????? It was the same thing for both The Perks of Being a Wallflower and The Spectacular Now. I keep hearing all kinds of mixed messages about this film. I heard it was wonderful...then that it was cliched trash...and now back and forth and back and...UGH...you're review has me sold. I will see this! It is very possible to not like this movie. I'd say it even walked a fine line for me. There are some missteps in the last act, for sure. But as far as being the most entertaining first hour of a movie this year, I had to give it a favorable review. It's just so genius. And pretty much technically perfect. Some narrative elements just don't totally work. Can't wait to hear what you think! Oh, and thanks! I'm glad I could sell you on it. It really is worth seeing, especially as a well-versed film buff. Great review! And like Drew said, I'm a little more sold on this because of it. Thanks! I hope you get to see it soon. Would love to read your thoughts on it. I really enjoyed it. It had a little bit of everything, coming-of-age, friendship on multiple levels, humor, sadness, etc. I also like how it didn't tell you everything like movies often do, although like you, I wish they would have explained a little more why Greg was so anti-fitting into any group. And even not knowing all the movies like you, I still found that funny, even though I might not have picked up on the subtle references. It really does have the whole package. I just wish the drama worked as well as the comedy. I wish they could've brought the fun comedic elements of the first act back around to the end somehow. I read the book and would most likely watch the movie because of it even if I wasn't completely sold on the movie. It helps that there's good word about it, though this looks like it would be under seen. Great review! I had the same issues with the end of the book that I did with the end of the movie. Everything else is utter perfection. This is a GREAT teen comedy that very few teens are going to see. Thanks!! It is good. And it would be a cool read (or watch) for any older teen. There is a fair amount of vulgar boy language in the book. Much less so in the movie. But, if your daughter is a Herzog fan, then this is for her.